ADH-41 (C2ETS2) is a premium, flexible, polymer modified, smooth, powder mastic white tile adhesive with superior hanging and non shrink properties. ADH-41 white colour is particularly suitable where a white wall adhesive is required such as glass mosaics and light coloured natural stone. ADH-41 smooth white tile adhesive is recommended for internal wall & floor applications. And is suitable for mosaics, glass mosaics, natural stone, porcelain tiles, plasterboard and Fibrous cement sheeting. 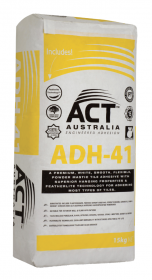 ADH-41 can be used over SCR-100 pre blended screed and for tiling over WP-1 and ACT Approved waterproofing membranes.